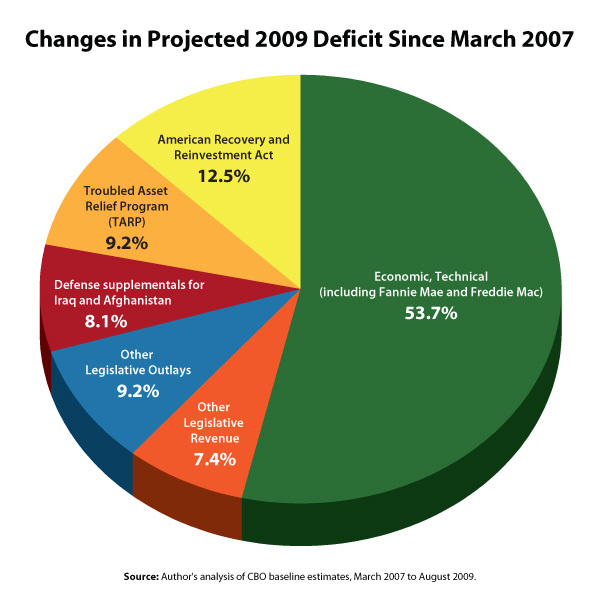 On August 25, the Congressional Budget Office (CBO) and the White House Office of Management and Budget (OMB) updated their deficit outlooks for fiscal years 2009-19. According to the CBO, deficits for 2009 are set to be $1.59 trillion, or 11.2% of GDP, falling to $1.38 trillion, or 9.6% of GDP in 2010. OMB’s estimates are similar. The deterioration in the budget outlook since 2007 is primarily due to the current recession and to policies designed to combat it (see chart below). An economic downturn will automatically create deficits because job loss and income declines reduce tax revenue and create more demand for public services such as unemployment insurance, nutrition assistance, and increased Medicaid spending. As a result of the current recession and the tax cuts enacted over the last eight years, federal revenue in 2009 will be the lowest since 1950 as a share of the economy. Economic and other technical factors add up to about half of the decline in the budget outlook since pre-recession estimates. The American Recovery and Reinvestment Act passed earlier this year (a.k.a. the stimulus bill) has added only slightly to the deficit – contributing only about 12.5% to the deterioration of the 2009 budget outlook since the start of the recession. Very little of the deficit deterioration is due to recent policy changes other than measures taken to spur the economy. Both the CBO and the OMB show deficits falling to more sustainable levels at the end of the 10-year horizon. Key to achieving this goal, however, is a robust economic recovery. A focus on near-term deficit reduction—through higher taxes or reduced spending—would choke-off the recovery and in the end would be self-defeating.